Many women would like to continue strength training during pregnancy, but are hesitant due to the seemingly inconsistent and diverse opinions on the subject. 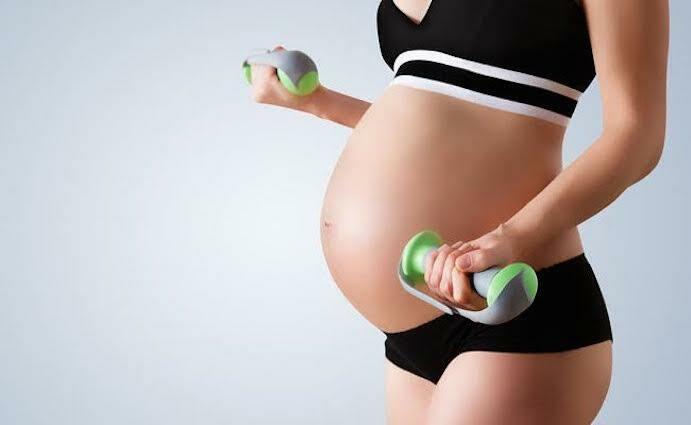 In recent years, however, a growing number of professionals from the medical and exercise science communities have te ndered specific advice for pregnant women interested in strength training. According to Updated Guidelines for Exercise During Pregnancy. Walking lunges, which may raise the risk for injury to pelvic connective tissue, and free weights, which may hit the abdomen when used, should be avoided. Instead, the use of resistance bands has been recommended. In addition, lifting while flat on one’s back, in the second and third trimesters, may cause the uterus to compress the inferior vena cava, into which blood from the pregnant uterus flows. “This increased pressure can be transmitted to the placenta and could compromise fetal blood flow in the gas-exchange area, thereby limiting oxygen supply to the fetus.” Instead, these movements can be performed at an incline. The Valsalva maneuver, that is, forcefully exhaling without releasing air, can rapidly increase blood pressure and intra-abdominal pressure and also may decrease oxygen flow to the fetus. Rarely, the Valsalva maneuver may result in a decrease in blood pressure. If you feel muscle strain or excessive fatigue, modify the moves and reduce the frequency of the workouts. Pregnancy is not the time to perform heavy weightlifting, but muscle strengthening according to the new guidelines will burn calories and increase the resting metabolic rate. Women possessing any of the American College of Obstetricians and Gynecologists (ACOG) contraindications for aerobic exercise during pregnancy should not participate in strength training . Women who have never participated in a strength-training programshould not initiate one during pregnancy. Women should be encouraged to breathe normally during strength training. Oxygen delivery to the placenta may be reduced during any act of breath holding (i.e., the performance of a Valsalva maneuver). Maximal lifts and heavy resistances should be avoided, especially after the first trimester when increasing amounts of the hormone relaxin are present. Since relaxin increases tissue laxity, the performance of heavy lifts later in pregnancy may increase the risk of injury to the joints, connective tissue and skeletal structures of an expectant woman. An exercise set consisting of at least 12 to 15 repetitions without undue fatigue should ensure that the resistance level is not too great during any particular strength exercise. As a training effect occurs, it is recommended that overload be achieved initially by increasing the number of repetitions and, subsequently, by increasing the amount of resistance. A pregnant woman should immediately consult her physician if any of the following warning signs or complications appear: vaginal bleeding, abdominal pain or cramping, ruptured membranes, elevated blood pressure or heart rate, or lack of fetal movement. History of three or more spontaneous abortions or miscarriages.